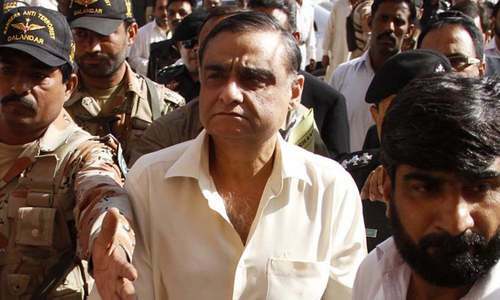 KARACHI: Former petroleum minister and leader of the Pakistan People’s Party (PPP) Dr Asim Hussain on Wednesday submitted a contempt petition in the Supreme Court against the Interior Ministry over the ministry’s failure to comply with the court’s verdict of striking off his name from ECL. On Nov 16, an apex court bench comprising Justice Mushir Alam and Justice Qazi Faez Isa had ordered the government to strike off Dr Asim’s name from the Exit Control List (ECL), allowing him to proceed abroad for medical treatment. The PPP leader is accused of corruption in two cases during his stint in the PPP government in the Centre and in one case he is charged with facilitating terrorists at his hospital. On Aug 29, Dr Asim was allowed to leave for London for a back surgery and was directed to submit a surety bond of Rs6 million. In the contempt petition submitted on Wednesday, Dr Asim has named Interior Secretary Arshad Mirza and other officials as respondents. The petition states that following the Nov 16 order of the apex court, the ministry was repeatedly reminded of removing Dr Asim’s name from ECL but they failed to comply. It pleads that contempt proceedings be initiated against them for flouting the SC’s orders.